iTunes U provides free educational content worldwide via the iTunes U app, which runs on iOS iPads and iPhones. By publishing content to the Tufts iTunes U site you will be serving a global audience of lifelong learners and contributing to the open education movement alongside many other institutions. Faculty and staff members of any Tufts University affiliated group can request that collections be published on the Tufts iTunes U portal. 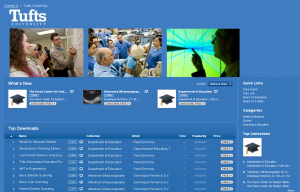 Read more about the requirements and guidelines for iTunes U material. If your material fits the requirements, request a new collection here.